Hi everyone! Arcadian Home offered to do a guest post on the dear old blog about colorful shabby chic bedrooms and I thought you guys would enjoy it! Let me know how you liked it! Shabby chic interior design has been popular for many years now. It’s aesthetic is one marked by aged, distressed or vintage home accessories and decor. With colors ranging from whites and pastels to the worn-out colors of woods and metals, shabby chic interior design is also ultra feminine. With an emphasis on texture and layering, it makes for a lovely look in the bedroom. So if you’re in need of a few ideas to get your creative juices flowing, take a look at these beautiful and shabby chic bedrooms. Who wouldn’t want to spend all day in this fluffy, gorgeous, shabby chic bedroom? 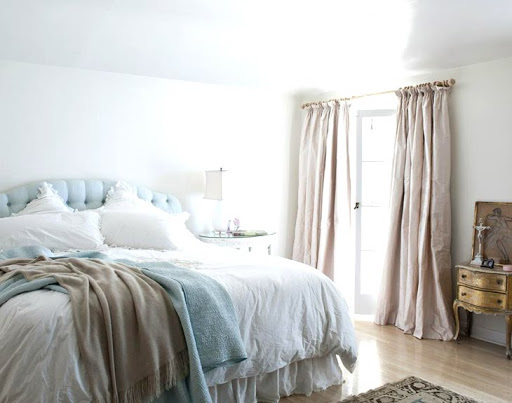 The color palette of robin’s egg blue and dusty rose are soft, pretty accents to the frilly white bed and white bedside table. Admittedly, the bed is lovely, but this wonderfully creative wall art steals the show. 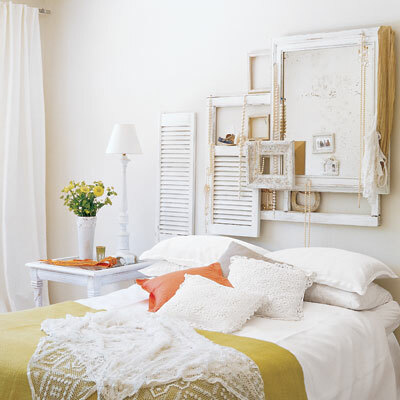 Acting as a headboard, the designer created an arrangement consisting of salvaged shutters, vintage frames and an old window. So pretty! This lavender and purple bedroom is perfect for any little girl with a sense of style. Texture is the star here — with different textures layered upon one another, from the woolly knit throws to the area rug and the heavy, printed curtains. When you hear or see, “brick accent wall,” you may not immediately think of something feminine, let alone, shabby chic, but that’s exactly what this lovely room is. The brick accent wall is softened by vintage nightstands and lamps, as well as a pretty chandelier and a soft pink throw. Shabby chic bedding is the star here, while soft pink roman shades and a flower vase full of pink roses add surprising bits of color. When done well, there’s something incredibly feminine and well-worn about the shabby-chic look. Though all different, these bedrooms are such dreamy havens, with plush white linens, antique furnitures and décor.